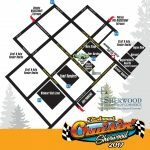 Thanks to The Springs at Sherwood and Avamere presenting the 2017 Cruisin’ Shuttle! The Springs at Sherwood and Avamere will operate a parking shuttle from Kohl’s (16685 SW 12th St Sherwood, OR 97140), from Sherwood Plaza Shopping Center (16260 SW Langer Drive, Sherwood, OR ) to the show at the corner of 3rd Street & Pine Street. The shuttle runs approximately every 15 minutes from 8 am – 430 pm (return trip) and is subject to wait times.